Astha Jhaldiyal did her Schooling from Amity, Noida. She then did her Graduation from Gargi College, DU. After that she did her MBA in sales and Marketing from Amity University. She was working as an Assistant Manager Sales with Zee Entertainment Ltd from 2014 - 2017. An advertising sales agent, sometimes referred to as an advertising executive, is someone who sells advertising space to businesses and individuals. They work in a range of industries, including advertising agencies, radio, television and internet publishing. 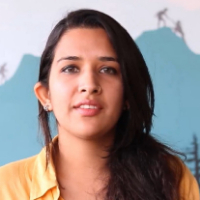 "After completing my Schooling from Amity, Noida, I did my Graduation from Gargi College. I then did MBA in Marketing and Sales from Amity University. I was working as an Assistant Manager Sales in Zee Entertainment Ltd."